The U.S. Justice Department on Tuesday accused poker celebrities Howard Lederer and Christopher Ferguson among other executives of a major poker website of defrauding poker players out of more than $300 million. The U.S. Justice Department on Tuesday accused poker celebrities Howard Lederer and Christopher Ferguson among other executives of a major poker website of defrauding poker players out of more than $300 million. WSJ’s Alexandra Berzon joins Digits with details. The U.S. Attorney in the Southern District of New York filed a motion Tuesday to amend an earlier civil complaint to allege that Mr. Ferguson, Mr. Lederer and two other directors for the website, Full Tilt Poker, operated what the Justice Department says was a Ponzi scheme that allowed the company to pay out $444 million to themselves and other owners, which included other famous poker players. In the motion to amend the complaint, the government alleges Full Tilt executives misrepresented to the website’s players that the money the company was supposed to be holding in player accounts was safely held when it was actually being used for other purposes, including payments to owners. The distributions to the owners, including Mr. Ferguson and Mr. Lederer, continued even as funds to pay out creditors—the poker players—dwindled because government investigators had made it increasingly impossible to move player money into company-affiliated bank accounts, the government says. “Full Tilt was not a legitimate poker company, but a global Ponzi scheme,” said Preet Bharara, U.S. Attorney for the Southern District, in a statement. An attorney for Full Tilt said he had no comment, and that neither did Mr. Ferguson. Attempts to reach Mr. Lederer on the phone weren’t successful. In response to the earlier version of the complaint, Full Tilt and other poker sites that had accepted U.S. bets have denied any wrongdoing, arguing that the U.S. laws covering online gambling aren’t clear. The earlier version didn’t allege defrauding of players or improper payments to owners. The government is also seeking money it says the four Full Tilt directors got from the site, which allegedly includes $42 million for Mr. Lederer and $25 million for Mr. Ferguson, who was allocated $85 million from the company but never collected all the money, the government says. The government’s amended complaint also alleges that two other directors defrauded players. One of those named directors is Raymond Bitar, the company’s chief executive, who was earlier indicted by the government for alleged bank fraud and money laundering. The company had previously denied any wrongdoing in response to the earlier allegations. The allegations follow months of speculation that Mr. Ferguson and Mr. Lederer, who grew famous winning poker tournaments, might be dragged into a federal case that began in April and has led to the suspension of Full Tilt’s operations. 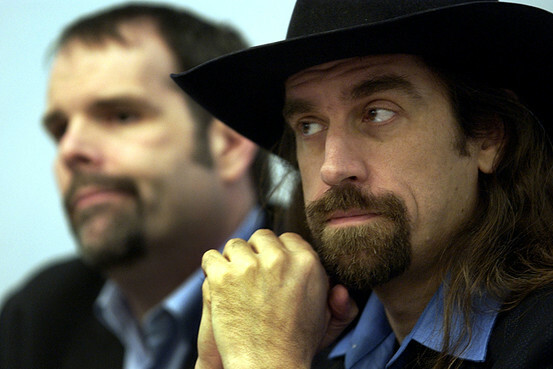 Chris Ferguson, right, and Howard Lederer at a roundtable discussion held by the Poker Players Alliance in 2006. Mr. Ferguson, Mr. Lederer and others started Full Tilt in 2004 and steered it to become an online giant, used by thousands of players betting billions of dollars every year. In April the Justice Department indicted executives at three major online poker companies on charges of illegal gambling, bank fraud and money laundering, including Mr. Bitar of Full Tilt Poker, who has been out of the country, and hasn’t been arrested or entered a plea. In civil charges the government also sought $3 billion from the companies and, through a court order, seized the domain names from the sites, which stopped operating in the U.S. following the action. Mr. Ferguson and Mr. Lederer have not been charged criminally. The Justice Department has long-held that online poker is illegal under several federal laws, while the poker web sites such as Full Tilt that operated in the U.S. argued that poker is not illegal in part because it is a game that involves skill and not purely chance. In a statement in August the company acknowledged that it had problems processing player money, along with also losing $115 million it says was seized by the government and $42 million it says was stolen from a third-party payment processor. “While the company was on the way to addressing the problems caused by these processors, Full Tilt Poker never anticipated that the DOJ would proceed as it did by seizing our global domain name and shutting down the site worldwide,” the company said in a statement in August. It said it is seeking outside investment to pay back all its creditors. The charges have upended an industry that became a booming online business and a cultural phenomenon in the last decade. They have also re-framed the debate around the legalization of online gambling. The U.S. accused Howard Lederer, shown above in 2006, of Full Tilt Poker of defrauding online poker players. The crackdown has shaken a large universe of poker fans, which researcher H2 Gambling Capital estimates included players using 1.7 million active accounts in the U.S. who before the April crackdown were wagering around $14 billion a year online. 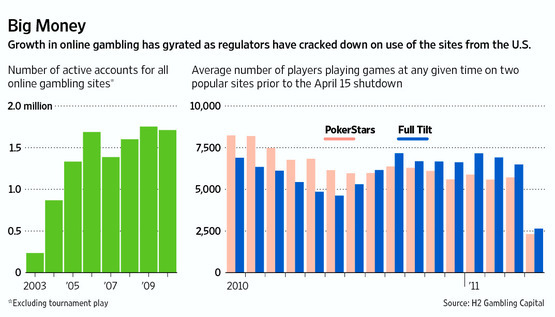 U.S.-based players are still owed around $160 million from Full Tilt Poker, according to the government. According to the latest filing from the Justice Department, Full Tilt Poker had just $60 million in the bank just before the April crackdown occurred, while it owed $390 million to players around the world. Yet the company had distributed around $10 million a month to its owners, the government alleges. Those payments stopped in April, according to the government. In June, Mr. Lederer reported to others at the company that there was only $6 million left, the government alleges.